You help your community look and feel its best – let us make your website look its best! Ready to look like a million bucks? We can design and build an attractive, affordable website that communicates your value at a glance and works like a dream on every device. We’ll help showcase your work in a way that calls out to your dream customers and instills a sense of professionalism and trust. If you’re the owner of one of these businesses, we want to work with you! Viva Design Studio acts as the hub of a network of trusted digital marketing professionals that can keep your business healthy on every front. We’ll act as the coordinator for your marketing efforts, and you’ll work directly with our associates for these additional services. For businesses in the beauty and wellness space, search visibility is critical and social proof is non-negotiable. Adam can help keep you at the top of your Google game, and he’ll make sure your social channels keep that word-of-mouth coming. Staying on top of the day-to-day care of your website is a tough job – let Josh lighten your load and help with regular content updates, software updates, security upgrades, and all the other behind-the scenes tasks that keep your site healthy. 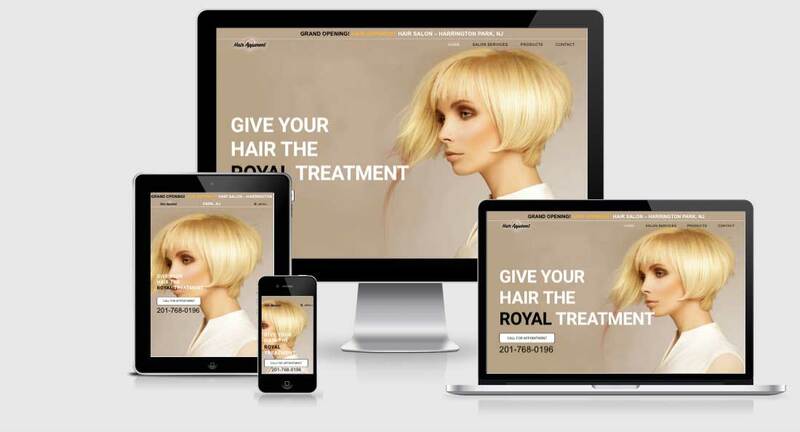 When this stylish salon in Harrington Park, NJ, wanted to put its best foot forward for its 2018 Grand Opening, we helped out by creating an upscale website that reflected their mission of treating clients like royalty. We worked with owner and lead stylist Jill Nagle to create a site that was as functional as it was attractive and that gave them a home base for reaching out to the community to promote their services. In addition to the full menu of products and services, we helped Jill set up an email newsletter to enable long-term outreach to customers. We’re happy to report that business is booming at Hair Apparent, and we look forward to watching their business grow and become an integral part of the community!